One of my favorite memories of my week in Tucson was arriving early for a day of metalworking with Diane Cook and having a few quiet minutes to study the class samples. 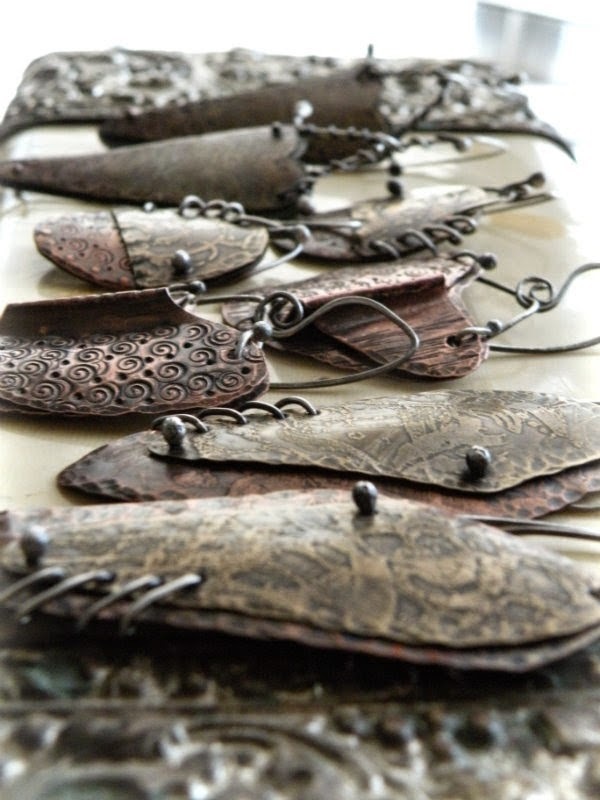 It was a class in texturing and layering metal to create earring designs. 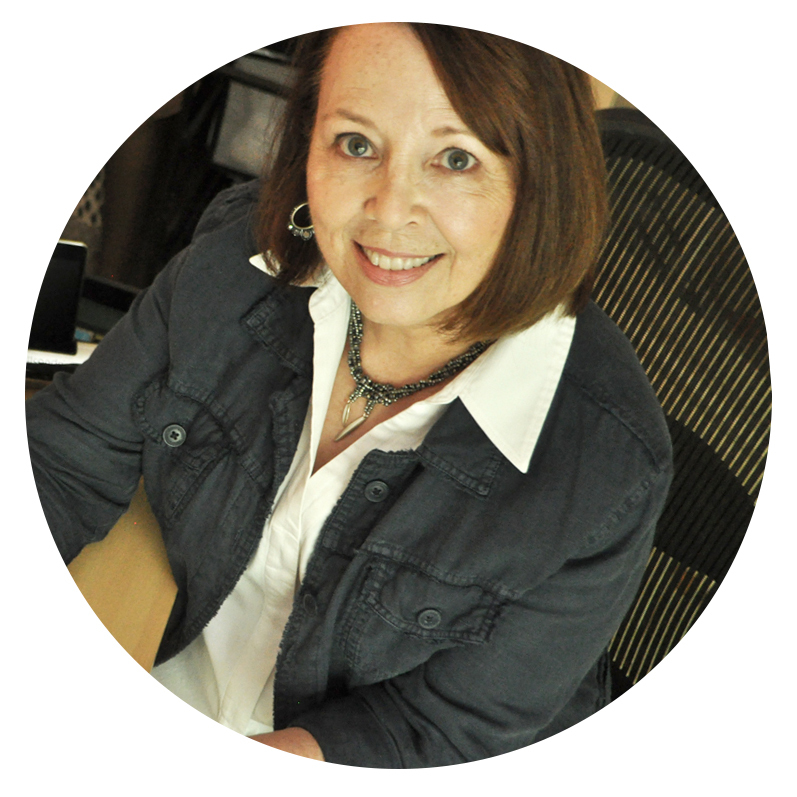 I’d long admired Diane’s ability to take simple forms and turn them into designs that have both an elegant and industrial vibe, and to view first hand the meticulous execution of her pieces was a real treat! This was my first time using a jeweler’s saw and my first attempt at fold forming, so despite choosing the easiest earring sample, I had only a few pieces of salvageable metal (and a lot of notes!) to pack up at the end of class. But the creative juices were flowing, and the small pile of false starts had been sitting on the edge of my worktable until this weekend when I decided to try my hand at those earrings again. Copper and nickel silver, etched, hand textured, patinaed and fold formed. Sterling ear wires. As I was cleaning up my workspace, a collection of peyote triangles from another project caught my eye. I decided to heat-patina some of my left over copper, shined up some pieces of etched nickel scraps, and sawed them into triangles. And then tried some more layering. I love the earrings that you made! Those earrings you made in class are wonderful! They have a great vibe, nice texture, and that shot of copper on the bottom just makes them! The triangles are such a great idea ~ the layering works so well and the ways to change it up are almost endless. Cannot wait to see more, Karin! I love that you're adding a new skill to your already-impressive repertoire -- the class earrings are a great combo of techniques. But those earrings that you included the beadweaving into? Oh my, oh my, those are right up my alley! Can't wait to see where this new path takes you! Your earrings are absolutely divine! Beautiful!!! Love the combination of delicious with the copper - such a great mash-up of colors and textures! Meant delicas of course - changed to delicious above thanks to spell check! You probably wondered what the heck I was talking about! Oh! missed this post!! what a lovely pair of earrings and an amazing technique. Can't wait to see where you go next with this!